Welcome to the twenty-fifth century, where the Earth is a polluted postindustrial nightmare, most animals are extinct and reptilian aliens are invading cities across the planet! In their time of need, the world's citizens turn to the time-traveling Booster Gold to save the day. To learn why these aliens are seeking revenge, Booster dives deep into the prehistoric past to see what happened the last time they hit the planet. 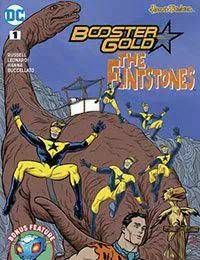 In this bygone era, Fred Flintstone and Barney Rubble must help Booster learn the truth and return to his own time armed with the information that will bring down the invaders if Booster can convince them to help him. No problem we all know how persuasive Booster can be, right? Right?! And in the backup feature starring The Jetsons, in a new twist on an old twist about our future, The Jetsons live in a world of robotics and gadgetry. But how does dying change when grandma's brain can be digitally imprinted onto a housecleaning robot?